I cannot deny it: I have a sweet tooth. Wherever I can squeeze in some sweetness, I'll do it. And what would be a better dish than a salad of lentils and green leaves? Both considered healthy and very nutrient-dense. Now make this sweet by making a vinaigrette out of cranberries and apple cider vinegar, and I'll be all over it. I made this for a potluck of Dubai-based food bloggers yesterday. I think it was a great success. After all, we had to compete with a whole lot of pasta salads, meaty dishes, homemade spring rolls, lamb chops and then, THE DESSERTS. I'll be honest: I didn't have one single bite of my own healthy salads ( I brought an even greener and leafier one - my Fava Bean and Arugula salad with Parmesan). Instead, I dug into all the pasta salads, meaty dishes and the desserts. After I tried two or thre desserts, I thought I might as well just eat all of them. And so I did. One yummier than the other. I left the potluck with a huge doggie bag. I haven't eaten much today. My system is still digesting all the foods that it usually doesn't get anymore, not in such amounts: the white flours, sugars, butter, etc. But I enjoyed every single bite. And even more: the company of like-minded people, that I otherwise would have never met. Our 1-year-old food blogger community of the United Arab Emirates is counting more than 70 members now, with extremes ends of our blogosphere probably being a blog that does cheesecakes only, the other end being a blog on how to grow your own veggies (in Dubai where it's 45C in summer and it never rains). I am very proud of being part of this crowd. An inspiring bunch of people from all over the world, currently based in Dubai (or surrounding) that loves good food, one way or the other. Place lentils, bay leaves and three cups of water in a saucepan. Salt slightly. Bring to boil, then cook over medium heat for about 20 minutes, or until lentils are done. In the meantime, prepare the dressing. Heat olive oil over medium heat. Add onions and cook until softened, about 8 minutes. Add cranberries, vinegar, water and honey. Let simmer for another 8 to 10 minutes until sauce has thickened. Season with salt and pepper to taste. Set aside. 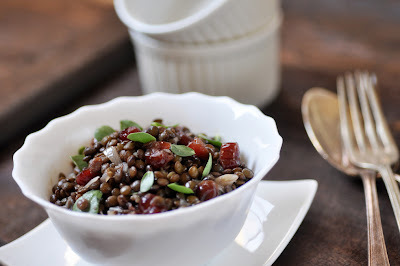 Drain the lentils when they done, and add them to the sauce while still warm. Stir thoroughly to provide even coating with the sauce. Add purslane leaves. Serve warm or at room temperature.